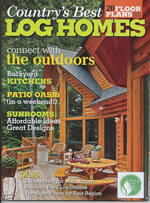 For more information on Country's Best Log Homes resources visit there website (www.countrysbestloghomesmag.com). Today’s outdoor kitchens are a far cry from the simple grilling stations of the past. “We’re seeing designs that are much more grandiose and elaborate – for example, if you incorporate a bar seating area and perhaps an outdoor fireplace, you’ve created the ultimate backyard oasis,” says Allen. Licensed professionals will not only help you create a functional layout, they’ll also help you plan the mechanicals—electrical outlets, gas lines, venting and plumbing. In addition, they’ll know when you need permits, and when you don’t, for such items as pergolas, new drains or extensive structural changes. As for shape and size, every design is individual, but many outdoor kitchen designers recommend L-shaped designs that offer some kind of barrier between guests and the chef. Many of today’s designs boast a comfortable bar area where guests can sidle up to an island for conversation and cocktails. Midsized designs—bigger than a wet bar not as big as the full-size kitchen inside—seem to be the most popular. Some suggest planning at least a 10-by-10-foot space for cooking and prep, and additional space for entertaining. Covered settings also provide space for ceiling fans and lighting fixtures, but if a covered location isn’t feasible, fear not. There are plenty of outdoor kitchens place on open patios these days that function well, thanks to weather-proof appliances and solutions. Because outdoor are exposed to the elements, different considerations come into play in terms of materials. Weatherproof cabinetry and countertops that can hold up against rain, sun and extreme temperature variations are essential. 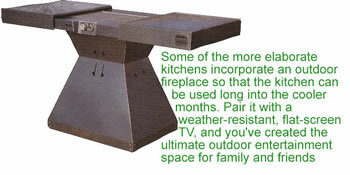 This is especially critical if your outdoor kitchen isn’t covered. For cabinetry, the top two options are polymer and stainless steel; both are incredibly weather-resistant. A third alternative is masonry cabinetry built from cement blocks or a metal frame covered in a decorative stone, stucco or brick veneer. The only downside to building with concrete block: It takes up a good portion of your cabinets’ interiors. If you have your heart set on wood, you might consider cabinets that feature teak or cypress doors within a weather-safe polymer cabinet box. “Wood can present some mildew issues and potentially be a fire hazard, so you want to avoid overusing it in an outdoor kitchen, “Allen advises. For countertops, consider natural stone, granite, porcelain tile, slate or concrete. Keep in mind that some darker concrete hues could be subject to fading or yellowing under extreme sun exposure, so you may want more neutral, earthy tones if you opt for concrete. 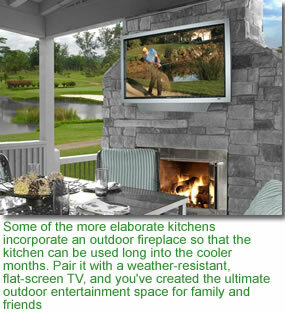 As for appliances, always opt for those that are specifically manufactured for outdoor use. Experts recommend 304-grade stainless steel. In addition, you can take extra precautionary measures to protect your outdoor kitchen from the elements. For example, you can purchase protective covers similar to boat covers; you can add a preservative, such as Sheila Shine, to your appliances; and you can cap off hoods so that rain cannot get in. “It’s also critical that you winterize outdoor water lines,” Franklin advises. Today’s elaborate designs incorporate outdoor refrigeration, sinks, built-in grills, fiber-optic lighting, fireplaces, beer dispensers, wine chillers, ice makers, and even all-weather LCD televisions and wood-fired pizza ovens. In addition, outdoor cabinets feature everything from built-in storage and pullout butcher blocks to dazzling center islands. Perhaps the most important ingredient of the outdoor kitchen is the grill itself. Today’s models feature side burners, multizone cooking capability, integrated shelving and storage, rotisserie attachments, warming racks and more. Some high-end models even boast a hybrid cooking drawer that allows you to cook with charcoal, wood and gas, all on one grill. Of course, some homeowners yearn for something less complicated, such as simply cooking over an open flame. In that case, consider a fire pit where guests can circle around and join in on the cookout fun. Other “back-to-basics” options include the Big Green Egg (a ceramic cooker) or an Indian clay oven. Simplicity can also be found in your outdoor kitchen surroundings. An alternative is to opt for a cold-water sink that is never used for food waste. “Then you can have gray water runoff via a French drain, where water runs underground and disperses,” Ledgard explains. The gray water can then be recycled for use in the garden. Simple or complex, outdoor kitchens are showing up in all types of climates and settings these days. Not too long ago, only Floridians and other warm-weather residents enjoyed such spaces. Today, even Alaskans are enjoying these outdoor havens.